This report is way overdue, but at least it is finally complete. This was the first of only two MOMAR's this year and the third year at the Squamish venue. For the first time, I decided to try a MOMAR solo. In the past I have raced with Garth Campbell and we have managed to get some respectable finishes, but have never been able to sit atop the podium. 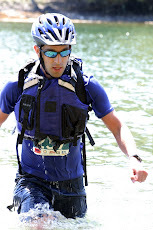 Garth is a stronger kayaker than me,we are similar speed on the mountain bike, but I hold the edge when running. Since there is not kayaking in the Squamish MOMAR, I decided to go solo to see if I had enough to make it to the top. Upon looking at the map handed out 1 hour before start time, I realized that this course was going to be a tough one and had a large amount of mountain biking. This was not good news for me since my biking is not as strong as my running. I also didn't really pay attention to the 3rd trek stage as it didn't look that significant on the map at first glance. Upon further inspection, however, I realized that that little trek was actually a climb up to the first peak of the Squamish Chief! If you have climbed it before, you know that it is more than a little hill with about 600m of elevation gain over a short distance. In all there were six stages in this race: short run, medium mountain bike, short navigation section, long mountain bike, ascent and decent of the Squamish Chief (including a rappel), and a short mountain bike. Originally there was to be a urban navigation stage as well, but it was cut as the course turned out to be taking too long. Soon enough the race was underway and everyone charged ahead in the first 4km marked running stage. Within a couple of minutes, Gary Robbins and myself had distanced ourselves from the rest of the pack. Since Gary has been doing some intense training for his upcoming Western States Ultra, I knew he would go out hard. I was determined to keep him in sight as I didn't want him to build up a big lead so early in the race. Gary had a good strategy going in though and only carried the required gear and not any liquids while I found myself lugging around over a liter of liquids plus some food. Within a few minutes, I also started to feel my right calf which I had stressed the week before doing too many stair repeats. While I continued to feel it for the remainder of the race, it was not super painful and probably only played a minor role in my performance. While I probably was working harder than I should have been at this point given the this length of race, I did manage to stay in contact with Gary and hit the transition only 17 seconds behind. With no shoes to change, I was quickly onto the bike with Gary a few seconds ahead. There was a moderate climb up some road and then onto some single track. Being stronger riders, Bart Jamula and John Markez passed me after the half way point in this stage. I was feeling reasonable, but for the first time since I had been using flats on my bike, I wished that I was using clipless pedals...and there was a lot of biking to go. I hit the navigation stage in 4th place. This is where I hoped to do well and make up some time. The navigation itself turned out to be pretty straightforward, but the controls themselves were all hidden. It was a bit frustrating getting to the correction location, and then having to search for the correct tree or root ball for the control. At the second control John caught up to me (I guess he must have gone elsewhere first) and since we were going at the controls in the same order, we helped each other grab a couple of them. I made no big mistakes, but did take longer to find the controls that I would have liked. Also, the course was small so my advantage in being able to run faster between controls than most people was reduced. I finished the stage at the same time as John, hopped on my bike and proceed to go the wrong direction down on the road! Luckily, I looked at my map and soon corrected my error. After bit more climbing on the road, we moved onto some single track that didn't look all that significant on the map, but ended up being quite a climb. While all ride-able, it seem to go on and on and definitely made me work. Eventually, the decent started and I had my hands full navigating technical terrain that is on the edge of my ability. There was even a log crossing that I convinced my body to ride before my brain knew what was up. Then back on the road for a bit of flat and then another climb to the start of another section of down hill single track. I wasn't rocketing up the hill, but kept it steady and controlled. I knew there was still a long way to go. The downhill single track was pretty much the same as it was in last years course and consists of a number of sections broken up by road crossings. Much of it is quite fun, but there are sections that test my abilities. Early in the decent, I misjudged a corner and had a bit of a wipe out over the handle bars and into some tree branches. The crash was minor and I got nothing more than couple of scratches. Unfortunately, it ended up bending my read derailleur which caused my gears to shift on their own. I managed to bend it back enough so that most of the time it would behave. Later in the race, however, I would end up paying more for this little crash. It could have been worse, however, as I later found out that John had crashed and had to pull out of the race. At checkpoint 8, I was told that I was in 2nd place. "Really?" Up to now, I was still expecting to be in 4th. That gave me a bit of a mental boost and I tackled some more uphill and cross country on the bike. 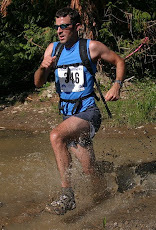 I thought I was moving pretty well, but Norm Thibault managed to catch me at the end of the single track. He was just in front of me for a long section of gravel road and wide trails to get us to the base of the Chief. At the time, I figured that as long as I didn't let him get far ahead, I could catch him on the climb. I actually passed him at the transition as he spent some time changing his shoes and refueling. 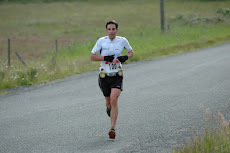 I managed a slow run to the start of the ascent, but my legs were tired after more than 3.5 hours of racing. I knew it was going to be a long painful climb with legs that felt like they had weights attached to them already. I put my head down, grabbed as many railings and trees as I could to help pull myself up, and did my best to power my way up. The one good thing was that my legs were so tired that my heart didn't have to work too hard. There were also a tons of tourist heading both directions that made the climb a bit of an obstacle course into itself. Eventually I reached the checkpoint at the top and took a quick look at the spectacular scenery. No time to doddle though and went back down a short ways to the rappel site. I wasted a bit of time getting into my harness which turned out to be a bit twisted up despite my efforts to pack it well. As I was getting into the harness, I saw Norm approaching. I was thinking, "No Way!, he can't have been that close to me." "You mean we have to go all the way to the top!!?" The rappel was long, but this being a race, I whipped down it as quickly as I safely could. My belay device was so hot by the time I finished, I almost burnt myself on it. Soon enough the harness was off and I was on my way back down. I proceed to have a quick, but controlled decent. This was no time to get injured just to save a few seconds. I saw many racers heading up and said hi to those I knew. At this point, I found out that Gary had actually dropped behind me during the navigation section and was not the one leading as I had suspected. 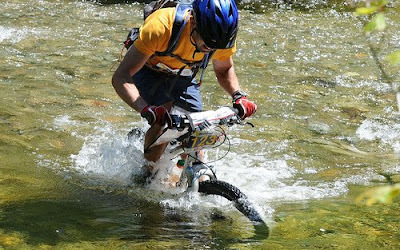 During the decent, I suffered my mild cramping, twinges of which I also felt at other stages in the race. 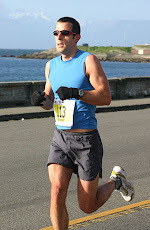 I was taking electrolytes, but probably not quite enough given the warm conditions and the challenging course. Luckily, compared to some other racers I talked to later, I fared well. Back on the bike for a short ride into Squamish. Along the way we got to cross a small river. I almost managed to power through it on my bike, but didn't quite make it. I make a minor navigational mistake after the crossing and as I revered course to correct myself, there was Gary. I did the friendly thing and told him I thought that was the wrong way and soon enough he was on my tail. On what was the last little climb of the race, I tried to shift down and most likely due to my damaged derailleur, my chain slipped off and into my spokes. Damn! I didn't panic as I thought it would be a quick fix and attempted to pull the chain out. It didn't want to come though no matter how hard I tried. Soon enough Gary caught up and as he passed he said "That's not right, that's not fair!" I will note that he never even slowed on his way passed. He was pushing hard and I don't know who would have won had I not had mechanical problems, but it certainly would have been closer. I do give Gary enormous credit for making up over 20min he lost in the orienteering to come in 2nd - that take fitness and well as mental determination. After a couple more minutes, I finally got the chain unstuck and was on my way to what I thought was the final transition to the urban navigation section. Unbeknowst to me, however, as I hadn't been notified, that stage was canceled as racers were taking too long to complete the tough course. I finished in 5:16:02, good for 3rd overall. Gary was 2nd and Bart raced to a well deserved victory with a finishing time of under 5 hours. Sarah Seads won the woman's division with a 6:31 time. Final results are here. While I didn't get the win and was disappointed to lose 2nd place so near the finish, overall I was fairly happy with my solo race. While physically I could have felt stronger, I avoided making any major navigational errors and didn't burn out. Congrats on the 3rd place finish! Great race report...that sounds like a super tough one!